"Sampath Speaking" - the thoughts of an Insurer from Thiruvallikkeni: India's Praggnanandhaa is the youngest International Master in the World .. !! India's Praggnanandhaa is the youngest International Master in the World .. !! Batting maestro Sachin Tendulkar’s son Arjun is part of the U-16 West Zone squad now. Sun Risers won the IPL – Ricky Bhui of Andhra, Siddarth Kaul, Vijay Shankar- were among the players part of the SRH squad who did not get to play a single match. Many of us could easily recall that at Mirpur, WI created history winning the U19 WC – Rishab Pant, who played for Delhi Daredevils was the wicket-keeper then…. So much so for the knowledge in Cricket – how many of us know : Praggnanandhaa and his glorious fete !! In Mar 2016, Indian ace Viswanathan Anand played out a thrilling draw with Holland’s Anish Giri but bowed out of contention for a ticket to the World Championship after the 13th and penultimate round of the Candidates Chess Tournament. That was sad news for fans, as for the first time in 10 years, there will be a World Championship without Anand, who has won the crown as many as five times. Either Sergey Karjakin of Ukraine or FabianoCaruana of United States will challenge Magnus Carlsen of Norway in the next World Championship match slated to be held in November this year. 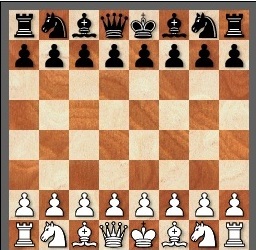 In the game of intelligence played on the square board divided into 64 alternating dark and light squares with 16 pieces each – it is the The World Chess Federation, FIDE (Fédération Internationale des Échecs) that awards several performance-based titles to chess players, highest being the Grandmaster title. Titles generally require a combination of Elo rating and norms. Once awarded, FIDE titles are held for life, though a title may be revoked in exceptional circumstances. A chess title, usually in an abbreviated form, may be used as an honorific. For example, Viswanathan Anand is styled "GM Viswanathan Anand". FIDE's first titles were awarded in 1950 and consisted of 27 Grandmasters (GMs), 94 International Masters, and 17 International Women Masters. IMs (International Masters) usually have an Elo rating between 2400 and 2500. After becoming an IM, most professional players set their next goal as becoming a Grandmaster. It is also possible to become a Grandmaster without ever having been an International Master. Awonder Liang the US Chess prodigy earned his third and final IM norm in Dallas in Nov 2015 when he was just 12 years, 7 months and 6 days old, becoming the youngest American ever to qualify for the title of International Master. Now there is a great Indian child prodigy – news reported in Indian Express, Chennai edition of date. There is a story that R Praggnanandhaa’s parents often invoke to peals of laughter from listeners. When he was taken to Slovenia for his first World Championship in 2012, he turned up at the venue tired and jet-lagged. 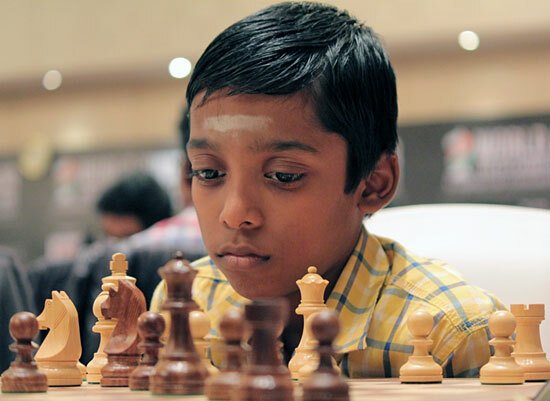 When his mother returned to check on him, she found Praggnanandhaa asleep at the board, his opponent waiting patiently for him to wake up and make his move.A couple of years on, the kid who slept during a game is one of the biggest stories in world chess. The 10-year-old from Chennai achieved his third and final International Master (IM) norm after beating a Grandmaster and holding two others at the KIIT International Festival of Chess in Bhubaneswar. In comparison, Judit Polgar, the youngest IM to date, did it only at 11-plus. Sergey Karjakin, the youngest Grandmaster ever and current challenger to Magnus Carlsen’s crown, became an IM at 11 years and 11 months. Praggnanandhaa is 10 years and 9 months old. “The youngest International Master in the history of chess,” his coach R B Ramesh delivers the punchline.“He got his first IM norm three months ago at the Cannes Open in France. The second came recently at the Aeroflot Open in Russia. In the Bhubaneswar tournament, he achieved his third norm and ELO rating of 2400 to become an International Master. Now, we just have to wait for the FIDE to process the documentation,” Ramesh says. Praggnanandhaa’s journey began when he was just over two years, watching his sister R Vaishali, herself a world girls’ under-14 champion, train. “He owes a lot to the two women in his life,” says his father A Ramesh Babu, a bank employee.“When his sister Vaishali started playing, we had little idea what to do. But by the time Praggnanandhaa started playing, we were able to provide him with all that he needs. Maybe that is why he has progressed so fast,” he says. Praggnanandhaa’s mother, Nagalakshmi, is the one who accompanies the little champ to every tournament.“I’m physically handicapped due to polio, so his mother has to take him and his sister everywhere,” his father says. Pray that he becomes one and bring more laurels to the Nation.